Indian Trails recently recognized 38 drivers who completed 2018 without a preventable accident. This is a remarkable accomplishment considering the thousands of miles driven, the often dangerous weather road conditions, and the countless unsafe drivers with whom they shared the roads each day. We’re proud to have such dedicated and professional drivers on our team, and to acknowledge their accomplishments with the 2018 Cora V. Taylor Safe Driving Award. The award is named for our co-founder, a similarly dedicated and remarkable woman who was the first female licensed chauffeur in the United States, as well as president of our company for 16 years. 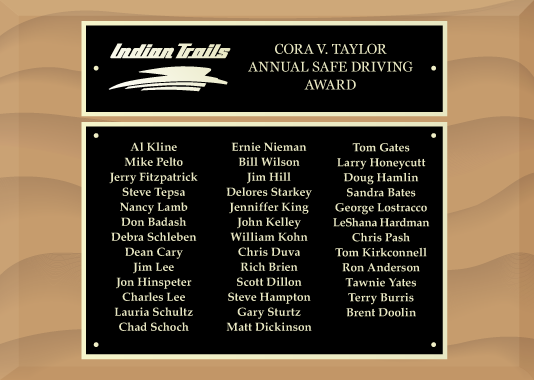 The names of these drivers have been added to permanent plaques on display at each Indian Trails location, and all have received a gift card in appreciation for their accomplishments. Their skill reminds us that safety is still everyone’s business in our 109th year of service. If you haven’t been to Detroit’s Eastern Market lately—or ever—now’s the time to get a group together, reserve one of our deluxe 34- or 56-passenger motorcoaches, and plan a day-long shopping and dining adventure. Each of you will need a pair of good walking shoes. Covering 43 acres and situated one mile northeast of downtown Detroit, it’s the largest historic public market district in the United States, established in 1891. Upwards of 150 food and specialty vendors sell their wares in and around five enormous sheds at Eastern Market. Surrounding the sheds are acres of food businesses, restaurants, galleries and boutiques. So, in addition to cash, checks and credit cards, everyone should also bring along a big tote bag or two. You’ll find fresh produce, flowers, plants, meat, poultry, seafood, cheese, eggs, honey, maple syrup, mushrooms, baked goods, spices, preserves, candies, coffee, wine, craft beer, artisanal spirits, clothing, local art and craft items, ethnic and gourmet delicacies, prepared foods, and innumerable other products. This brochure will give you a good idea of the layout, as well as where the vendors are located. The focus is on small, independent, local companies serving both retail and wholesale customers. The market is managed by the nonprofit Eastern Market Corporation on behalf of the City of Detroit. If you need a break from shopping, dining experiences galore will await you nearby. There are a multitude of choices within walking distance, everything from pizza, deli sandwiches, and Coney dogs to fine dining with meals cooked over a wood-fire grill or served by wait staff in formal attire. That depends on what might float your boat besides food shopping. 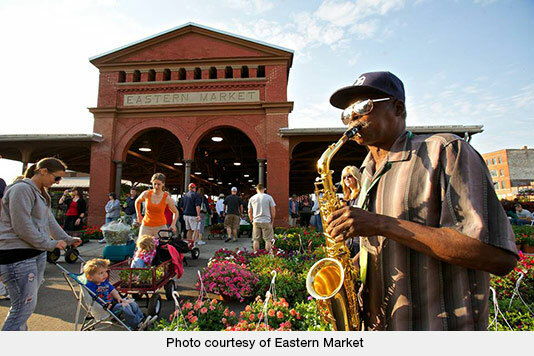 For the latter, Eastern Market draws the biggest crowds—as many as 45,000 visitors a day—to its year-around Saturday Market during the late summer harvest. But it also operates seasonal markets on Tuesday, Sunday, and every third Thursday night from June through September. Here are detailed descriptions of each market. You may also want to consider scheduling a charter group visit during one of Eastern Market’s special events. For example, Flower Day is a springtime tradition featuring thousands of plants for sale across 15 acres—practically every imaginable flower, succulent, bush and tree. It’s always on the Sunday after Mother’s Day, which is May 19 this year. 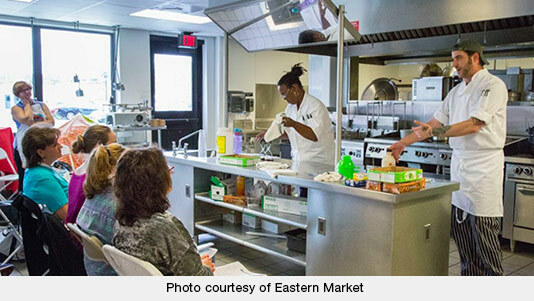 Or, you could time your shopping and dining extravaganza with one of Eastern Market’s cooking classes, which are conducted in partnership with edible WOW magazine. Some classes are free and open to the public in Shed 5. They feature local chefs preparing specific dishes with products provided by market vendors. Attendees can taste the finished dishes and get a recipe to take home. Other classes are limited to about three dozen participants, cost $35 each, offer a more personalized experience with a guest chef, and include chances to win prizes such as a gift basket or dinner at the chef’s restaurant. Yet another possibility is to coordinate your shopping trip with a Detroit Lions tailgate (details TBA at this link)—a tradition at Eastern Market—followed by a one-mile walk or bus ride to watch a home game at Ford Field. Space for one of our buses at the market tailgate would cost about $200. Between September and December this year, the Lions will play the Bears, Packers, Vikings, Cowboys, Giants, Buccaneers, Chiefs, and Chargers at home, but dates and times have yet to be announced. 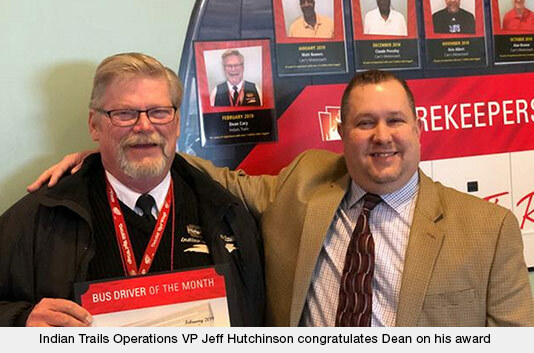 He suspects the former is one of the reasons he was recognized in February as “Bus Driver of the Month” by Firekeepers Casino in Battle Creek, Mich. In the award ceremony, Dean says executives there praised him for “always having a smile on his face,” as well as for helping passengers. Dean’s path to Indian Trails began near the end of a 30-year service career as an executive with the Boy Scouts of America in Traverse City, Mich. He’d begun working as a field representative, helping to organize units, troops, and summer camps, and eventually became an executive for the Scouts in Traverse City and the Flint area. As he was considering retirement—and looking for something else to do to keep busy—he stopped by the office of Indian Trails’ former VP of Operations Ken Henry to drop off some scouting forms his son needed. 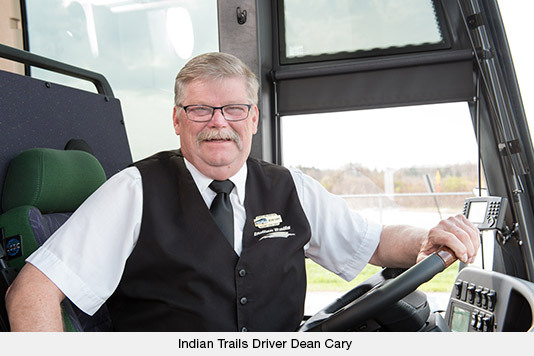 Since 2006, Dean has driven our motorcoaches on scheduled routes and charter trips, and as a relief driver for Michigan Flyer, our shuttle service that makes frequent, daily runs between East Lansing, Ann Arbor and Detroit Metro Airport. Nowadays, he transports customers to and from specific sites such as Firekeepers, where he heads every Tuesday after picking them up in the Greater Lansing area. The joy Dean found in working with the Scouts has extended to his motorcoach passengers, many of whom are senior citizens. “I become friends with so many regular passengers that I have to keep updating the contacts list in my phone,” he says. One happy encounter Dean recalls happened when he was checking passengers in for a Michigan Flyer run and came across a familiar name. With increasing frequency, hackers have been successfully targeting the computer systems of travel-related companies. In fact, they’ve stolen the personal data of hundreds of millions of travelers over the past few years. As the consumer tech website Digital Trends reports, cybercriminals breached the website of Orbitz, the online travel agency owned by Expedia, and may have gained access to encrypted credit card data for 880,000 people in 2016. They hacked into British Airways in 2018 and stole personal and financial information on 380,000 customers. Just months later, hackers got extensive information on 9.4 million customers of Cathay Pacific, a major Hong Kong-based airline that serves seven U.S. cities. And the personal data of some 380 million travelers was compromised in a years-long breach of Marriott’s Starwood Preferred Guest database. If that’s not enough to convince you to take extra precautions with your data when traveling, it recently came to light that the e-ticketing systems of at least eight airlines—including Southwest, KLM, and Air France—had a serious vulnerability: It could let hackers intercept the credentials of passengers who logged onto the airlines’ sites to check in for flights. What kind of data is being stolen? Depending on the specific breach, it can include passenger names, emails, phone numbers, billing addresses, birth dates, gender, passport or ID information, booking preferences, flight numbers and times, seat assignments, full boarding passes, and credit card details, among other things. What can cybercriminals do with such data? Again, depending on the particular unauthorized access, it’s possible they could cancel or change your airline reservations, steal your identity, open credit card accounts in your name, withdraw money from your bank accounts, go on shopping sprees, and ruin your credit. Change passwords frequently, use a different password for each account, and use password management software to keep track of them all. Set up two-factor authentication on any accounts that offer this protection (for example, in order to login, you must provide the answer to a secret question in addition to a password). Refrain from using unencrypted public WiFi and hotel networks to send important information. Consider printing your airline boarding pass at home instead of checking in with your mobile phone at the airport. Make it a point to monitor your credit card and bank statements for any suspicious activity. Beware of email phishing scams designed to trick you into divulging personal information to what appears to be—but is definitely not—a company you know (examine the sender’s email address for starters). Get a free credit report every year at annualcreditreport.com and review it for any discrepancies. Beyond those steps, you can temporarily “freeze” your credit reports by contacting the major credit bureaus. This prevents identity thieves from applying for credit in your name. How to do it—and know the difference between a free “freeze” and a costly “credit lock”—is explained in this excellent article by Krebs on Security. It also tells how to opt out of prescreened offers of credit or insurance sent by postal mail, which identity thieves like to intercept.